The Baltimore Ravens selected Marlon Humphrey with its first-round pick in the NFL draft Thursday. 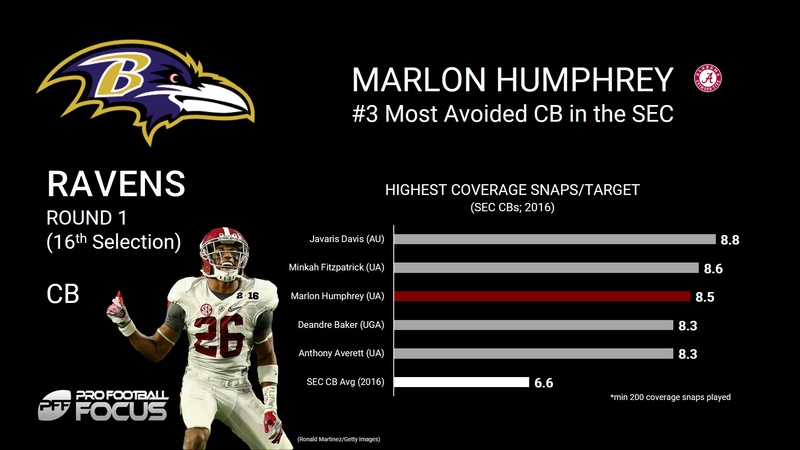 QBs avoided Humphrey in 2016, as he ranked third among all SEC CBs (with a minimum of 200 snaps in coverage) with an average of 8.5 coverage snaps per target. Humphrey’s overall grades of 84.4 (2016) and 86.0 (2015) over the past two seasons each ranked within the top five for SEC cornerbacks. 20 of the 30 incompletions on throws into his coverage were a result of either an interception, pass breakup, cutting a receiver off or getting close enough in coverage to force a difficult catch. 87 percent (1,550 out of 1,794) of Humphrey’s defensive snaps in the past two seasons have come from the left cornerback position.